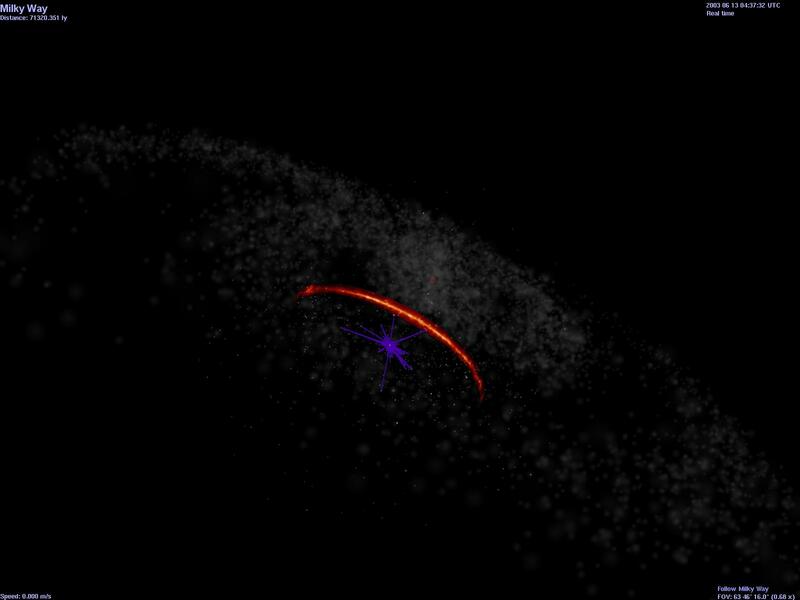 Spokes of stars in StarsDB v2? 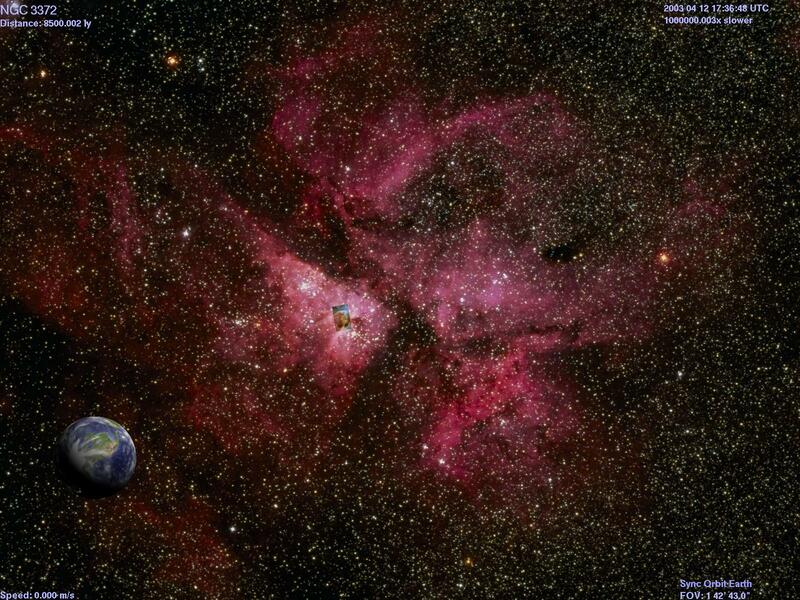 Click on an image below to see the full sized picture. 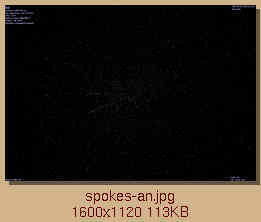 The pictures they link to are typically 100-200 KBytes. 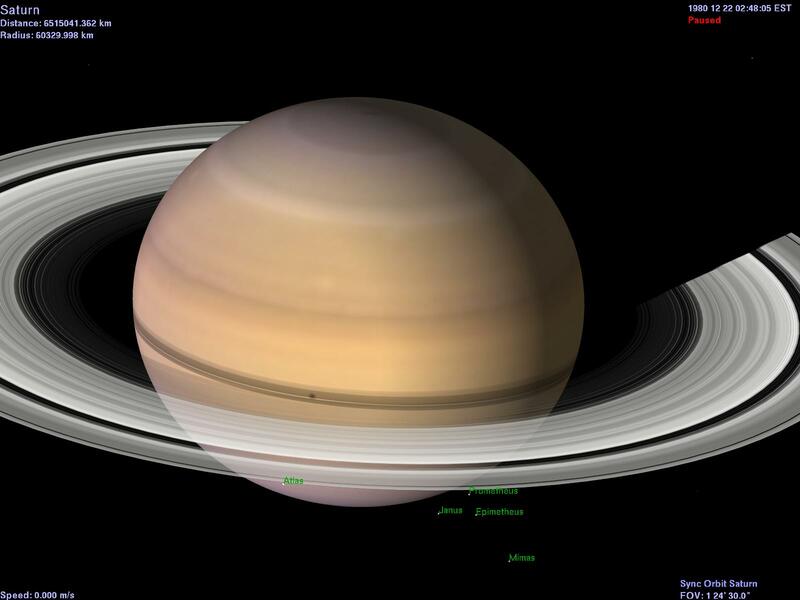 This view can be seen in Celestia 1.2.4 with no addons. 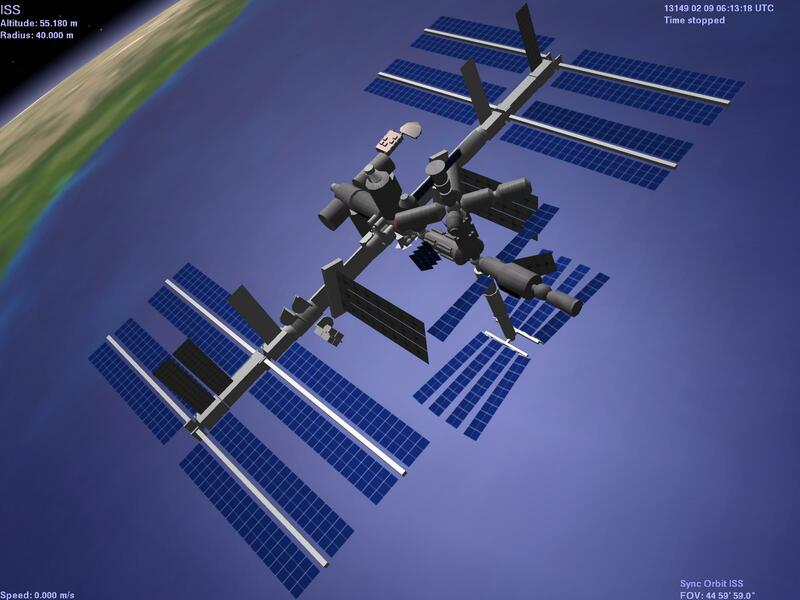 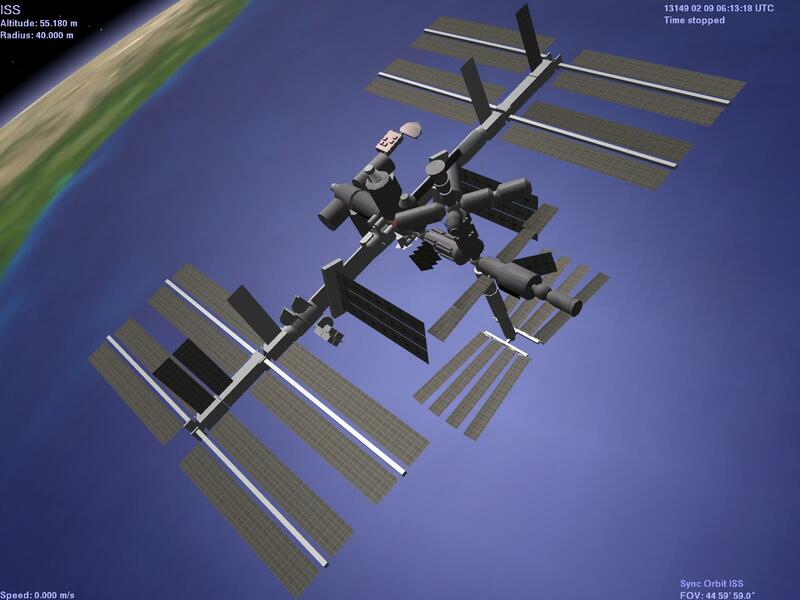 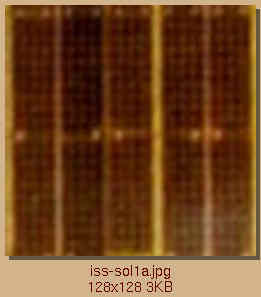 These were cut from a photograph of the solar panels actually used on the ISS. 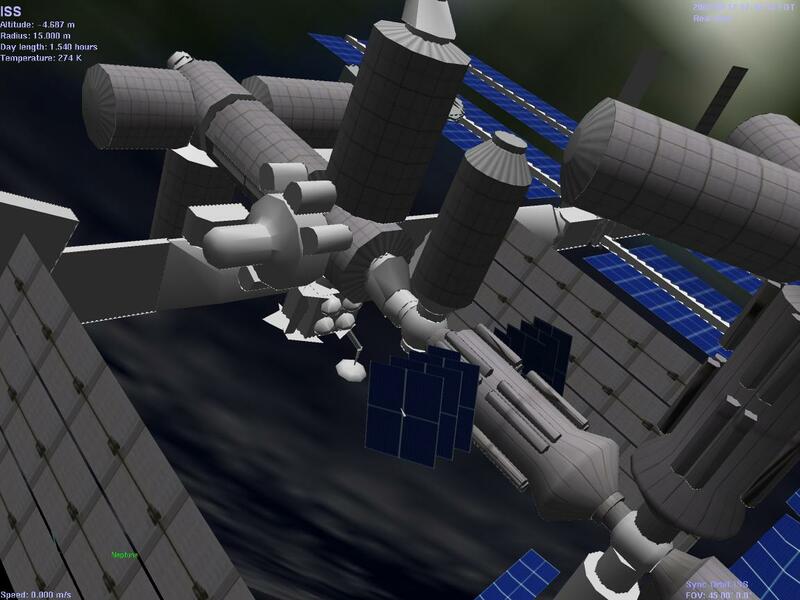 This view requires the INTEGRAL 3ds model. 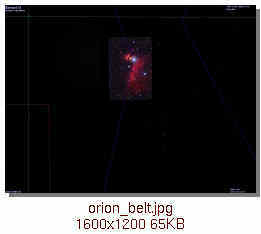 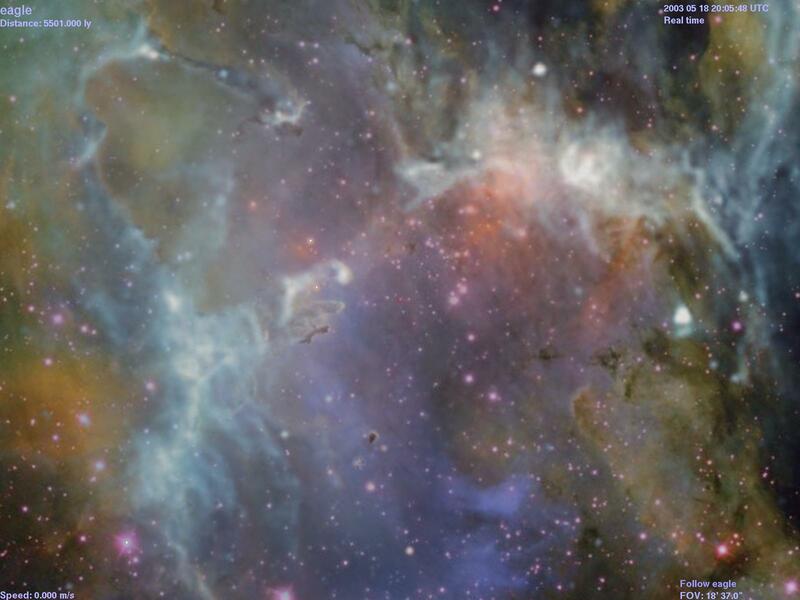 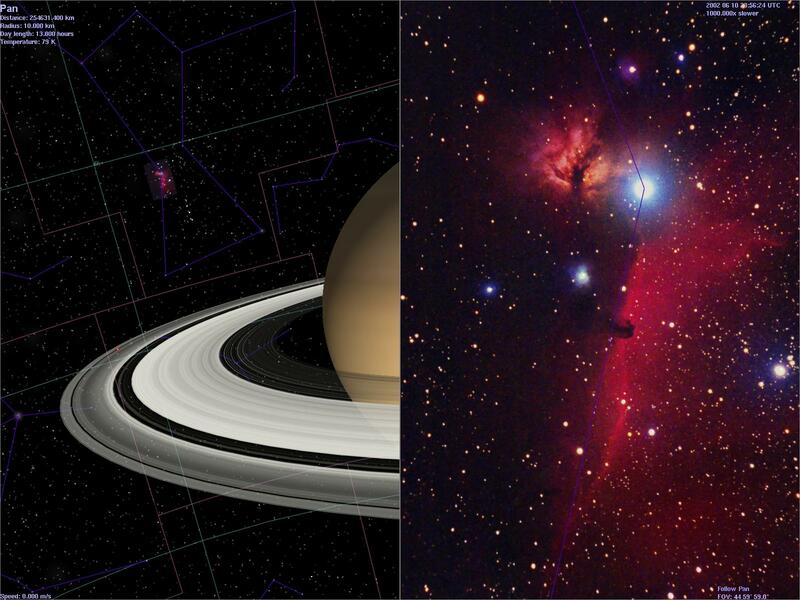 Viewing the Nebulae shown below requires Celestia v1.3 or later with appropriate billboard objects displaying images of the Carina and Eagle Nebulae. 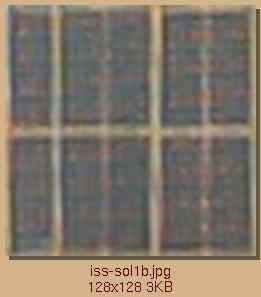 See billboard.html for details. 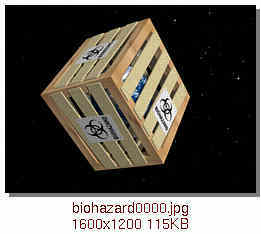 Sorry: this image had to be taken down. 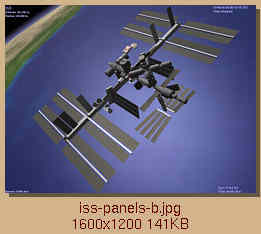 MySpace doesn't seem to understand the concept of "theft of bandwidth". 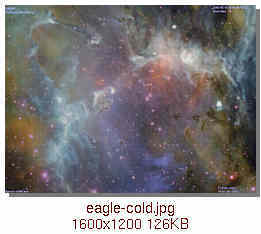 If you'd like a copy of the picture, please contact me. 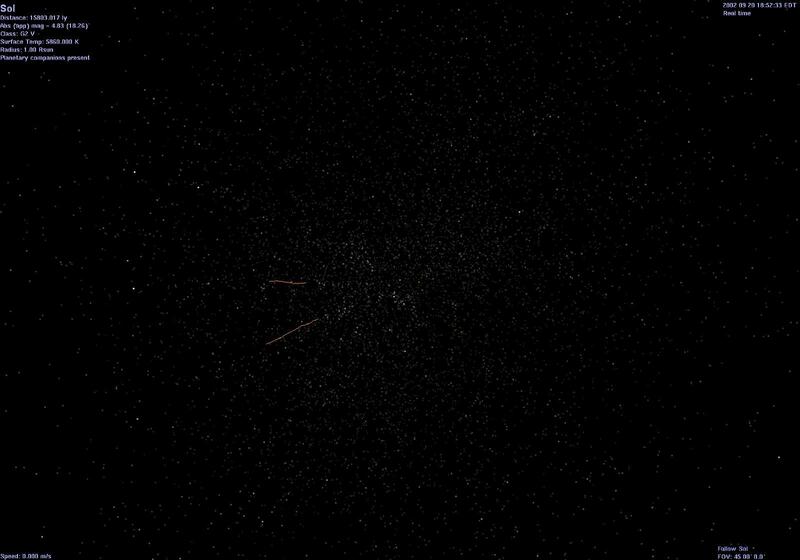 To see this in Celestia, you'll need to install the 2,000,000 stars.db addon. 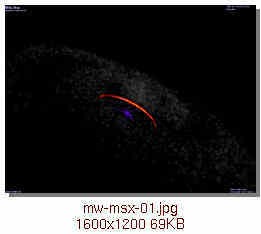 This view requires a Shoemaker-Levy 9 SSC file. 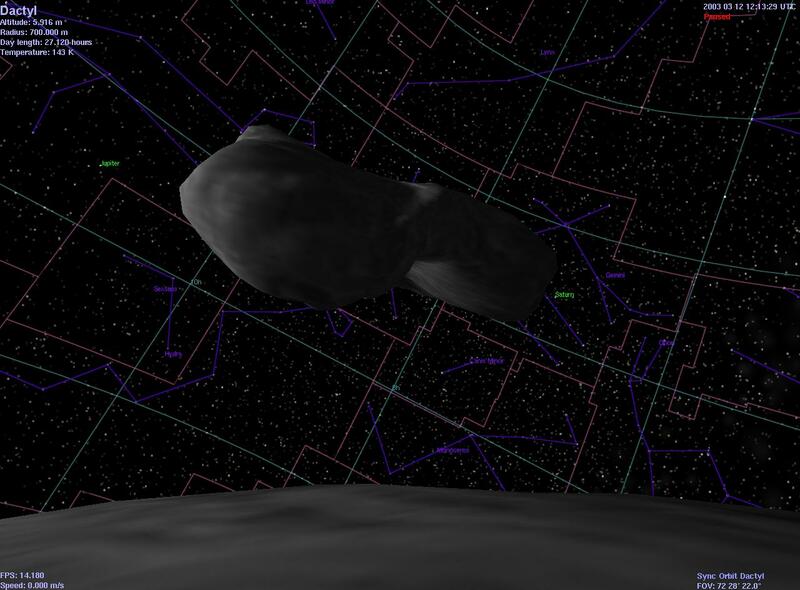 Shoemaker-Levy 9 ephemerides are on the Cometary Orbits page. 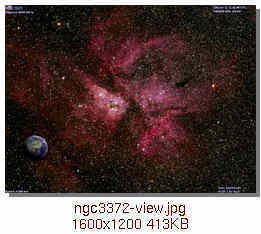 This view was manufactured by creating an STC file defining 3 stars very close to one another. 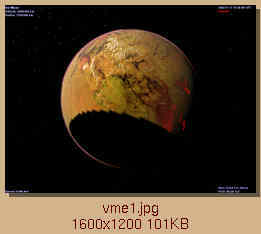 This view was obtained by putting Don Edwards' Volcanic Moon in orbit around Mars. 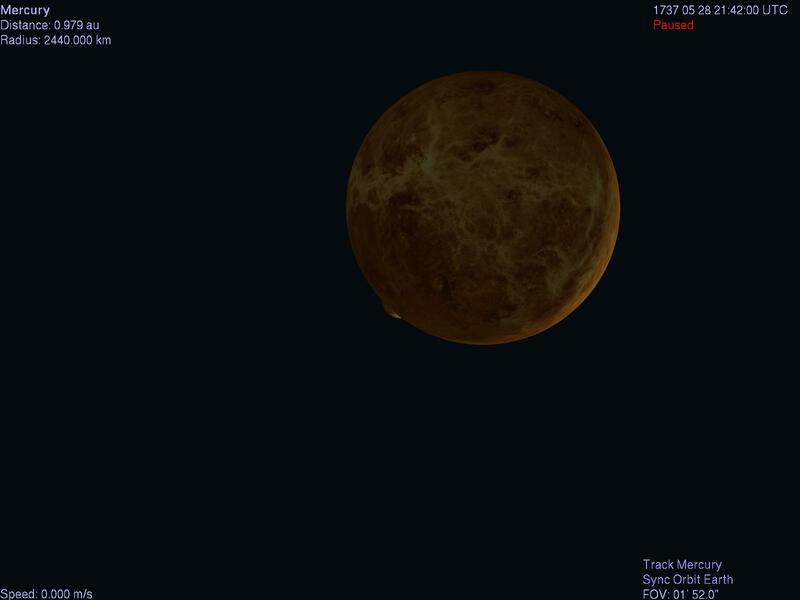 Venus Occults Mercury in 1737 . 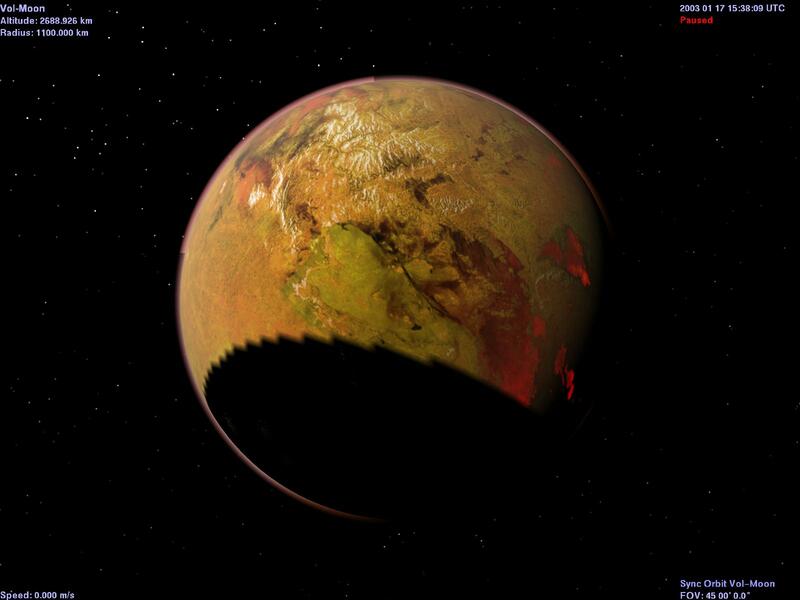 As it might have been seen from over Hawaii. 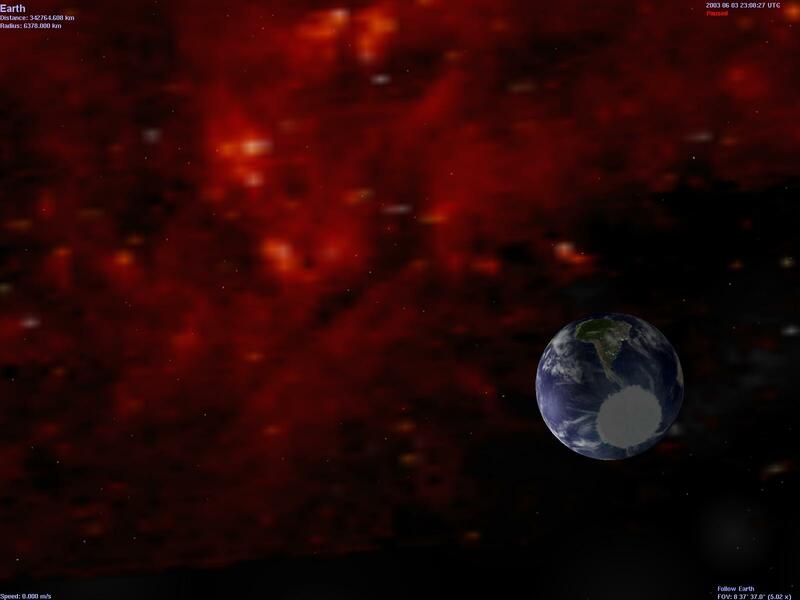 And if Venus had no clouds. The visible moon is Ganymede. 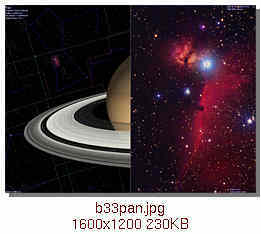 Note the different (improved!) 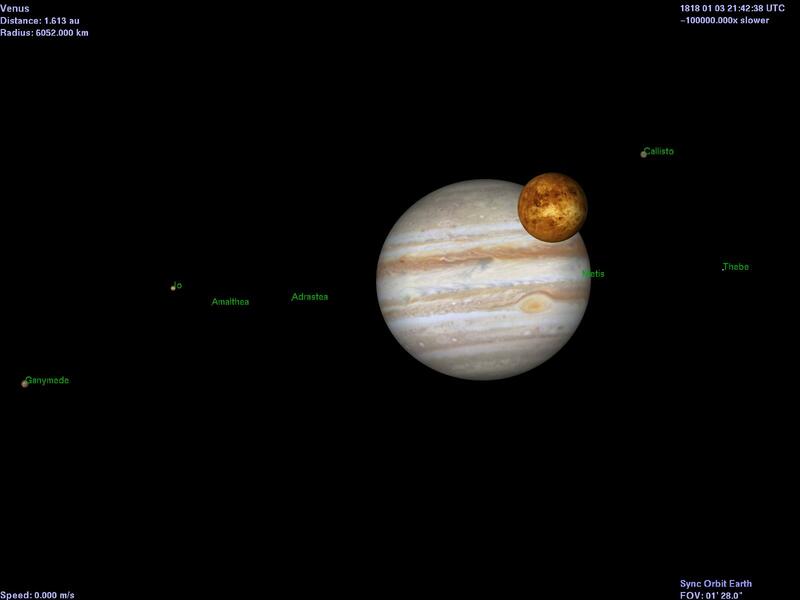 location of Ganymede On May 28, 1737, John Bevis observed portions of the passage of Venus in front of Mercury from Greenwitch Observatory. 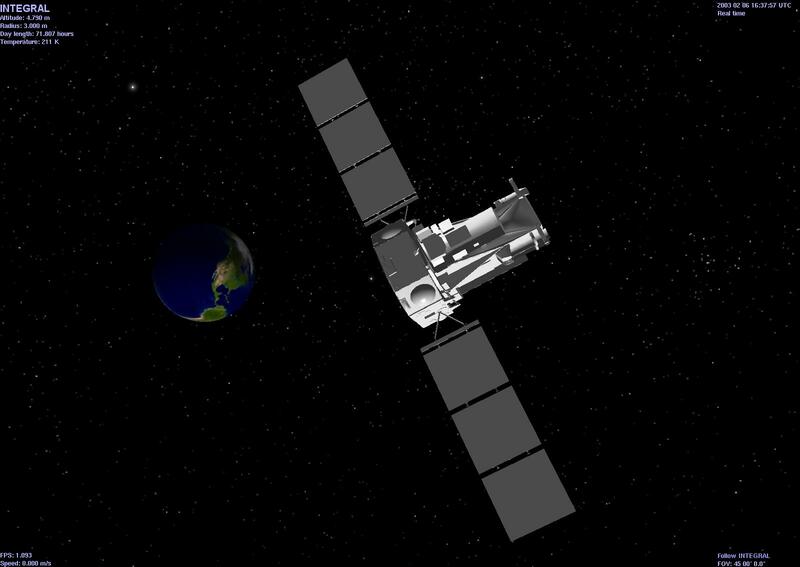 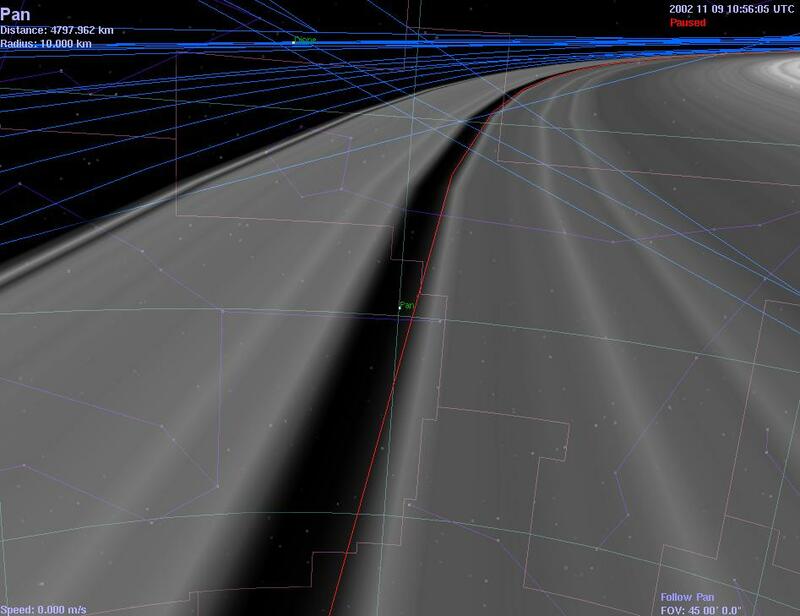 Here's Celestia's image of that event, as viewed (roughly) from the location of Greenwitch. 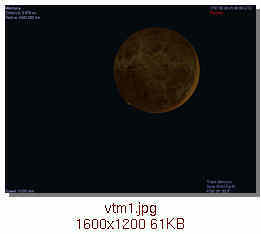 A small piece of Mercury is visible past the lower left edge of Venus. 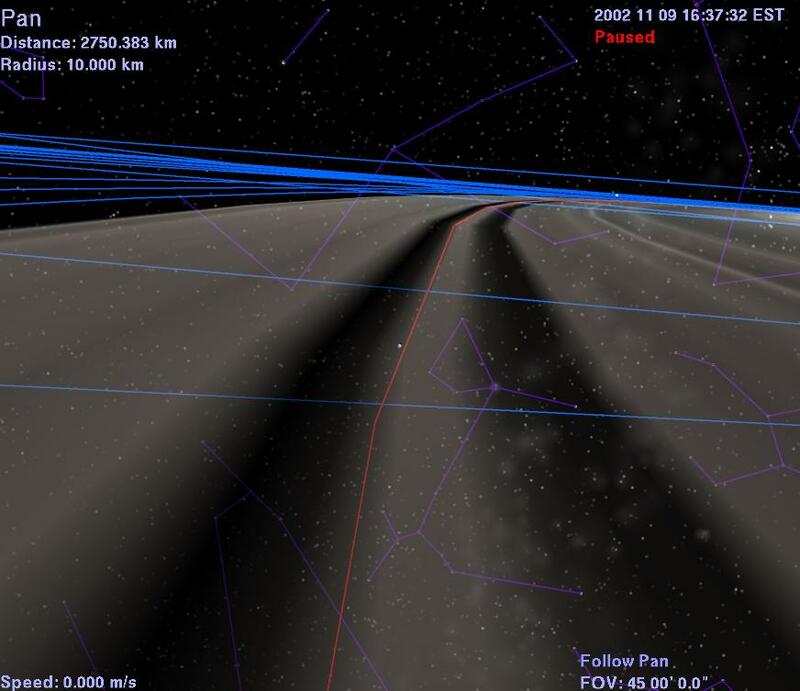 Since Celestia does not implement light travel time, the time and appearance of this event is distorted. 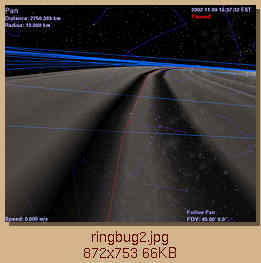 Mercury is about 1 AU away (8.3 light minutes) while Venus is only about 1/3 of an AU away (less than 3 light minutes). . 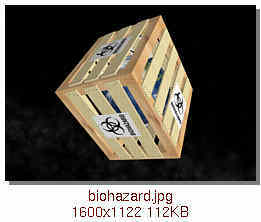 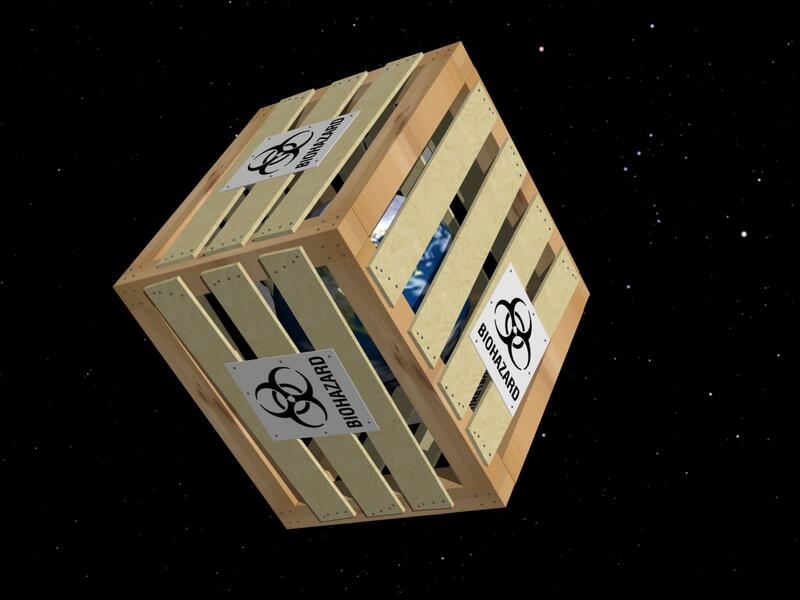 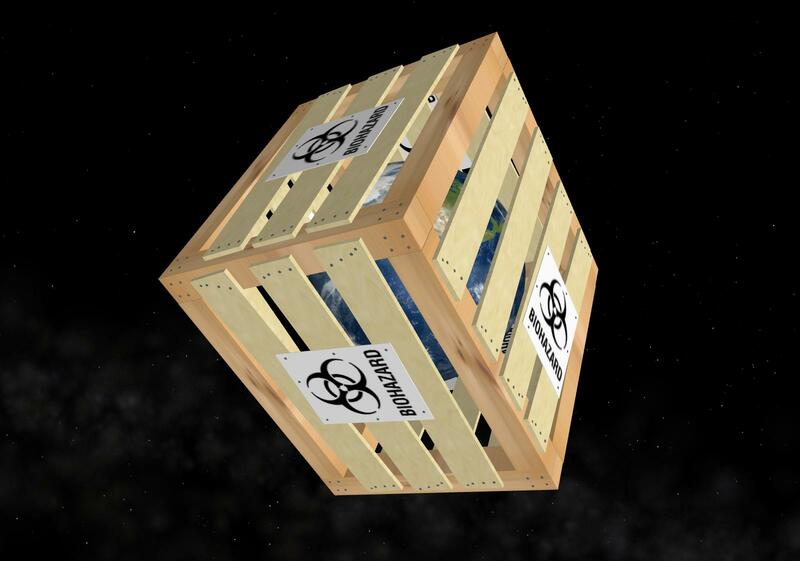 Rendered using Anim8or biohazard.zip (550KB) Addon to put a wooden crate around the Earth: it's a biohazard. 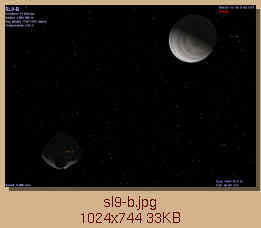 Lunar Eclipse on 8 November 2003. 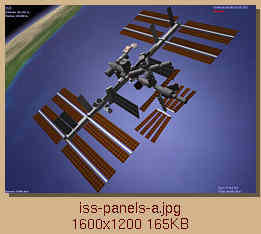 As seen from over the eastern Pacific. 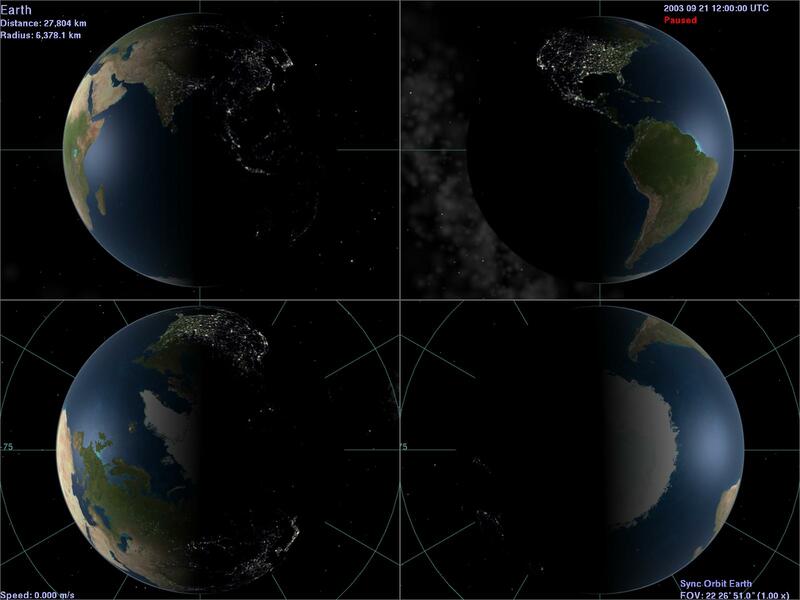 Baja California is in the lower center of the image. 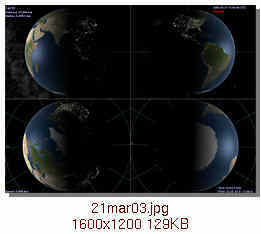 Spring Equinox: 21 March, 2003. 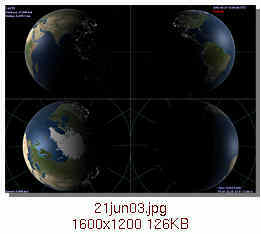 Summer Solstice: 21 June, 2003. Fall Equinox: 21 September, 2003. 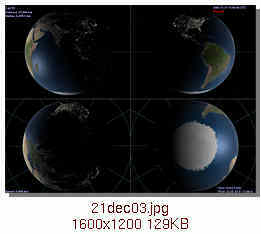 Winter Solstice: 21 December, 2003. 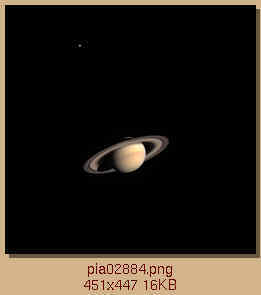 Telescopic view as seen from above the FingerLakes of NY. 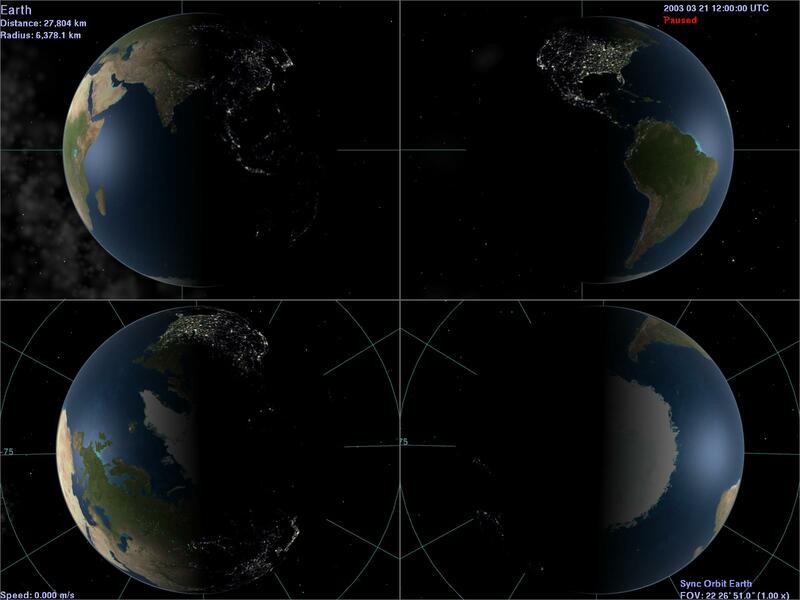 This view requires Celestia 1.2.5pre7 or later. 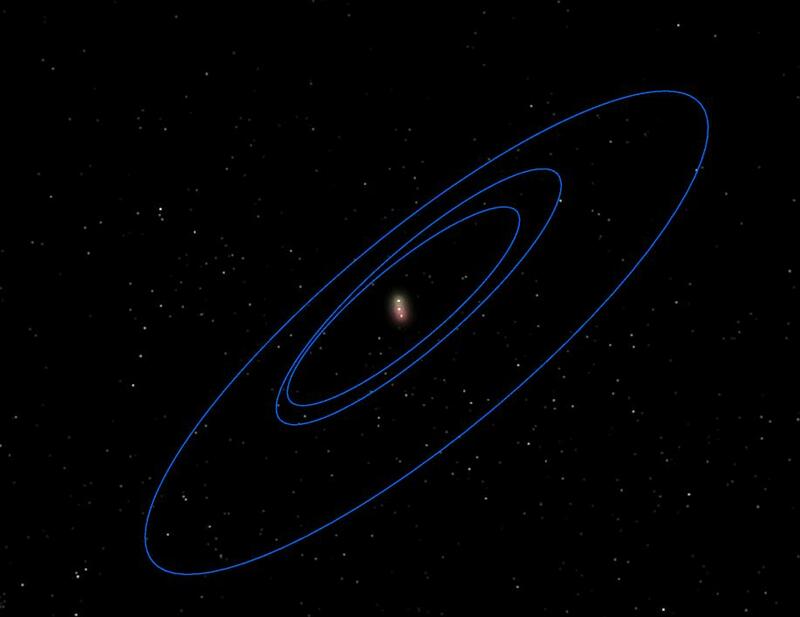 The orbits defined in 1.2.4 aren't accurate enough. 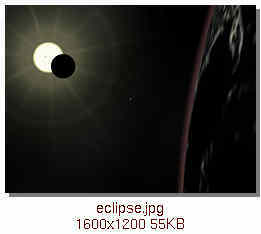 It happened during the day and near the sun, so nobody would have seen it even if they'd had telescopes way back then. 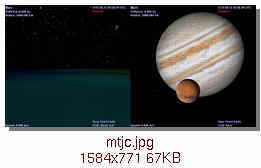 Gervase of Canterbury observed Mars transiting Jupiter on the night of Sepember 12th, 1170. 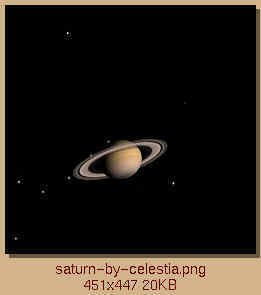 Here's Celestia's view of this event as seen from above England. 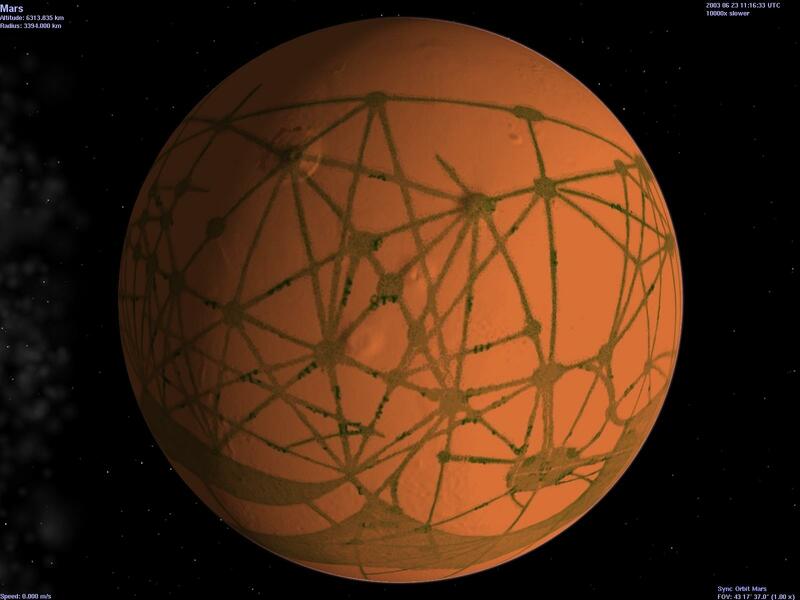 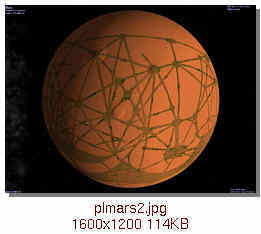 Mars as imagined by Percival Lowell. 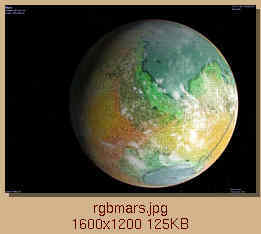 This view requires a special surface texture for Mars. 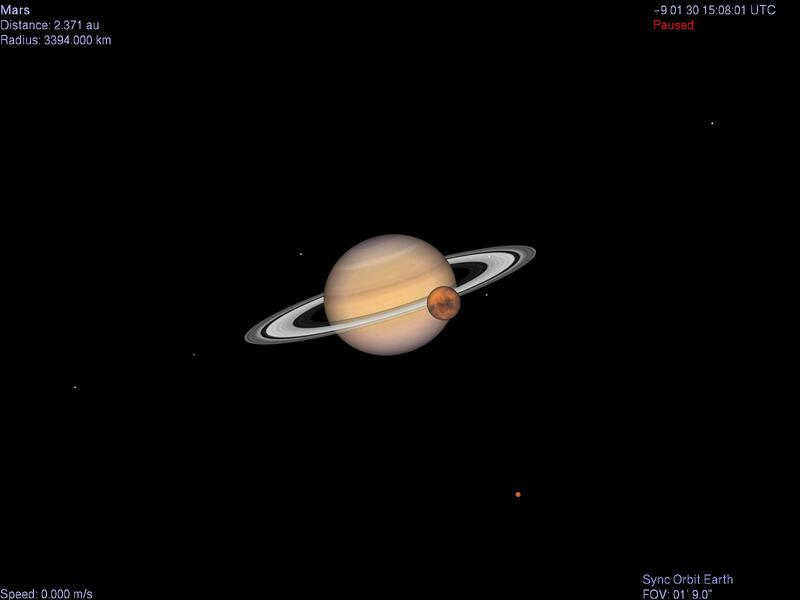 See Frans Blok's RGB Mars. . 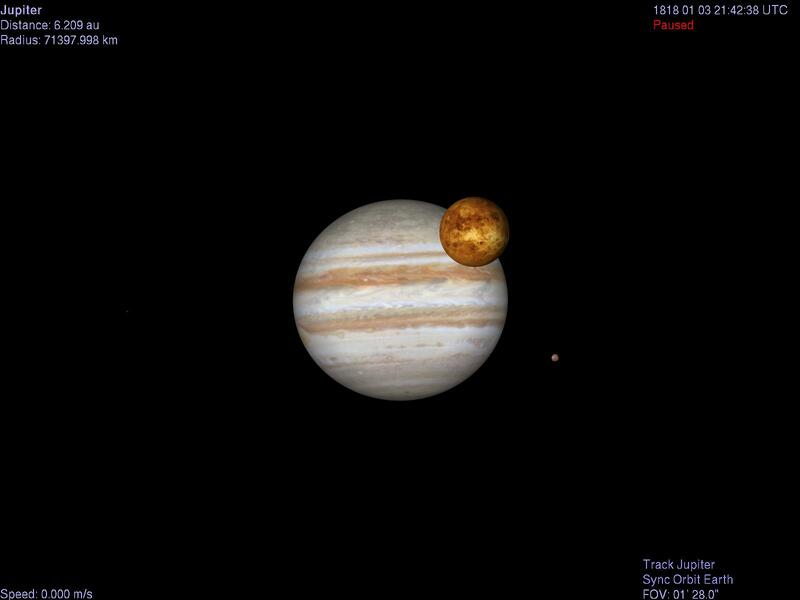 This happened during the time Galileo was observing Jupiter, but while Jupiter was out of sight of Italy. 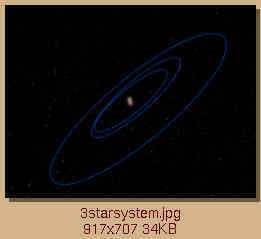 Apparently he noted Neptune as a star. 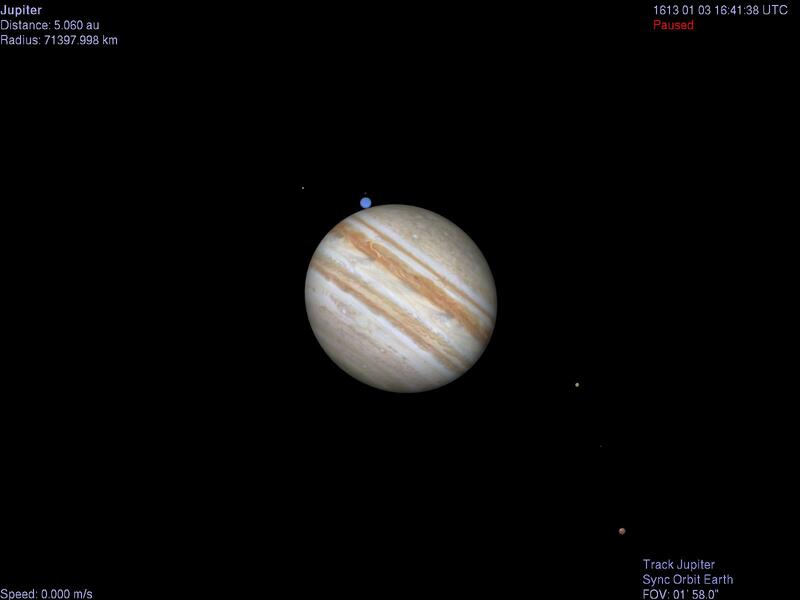 The bright foreground moons are Europa and Ganymede. 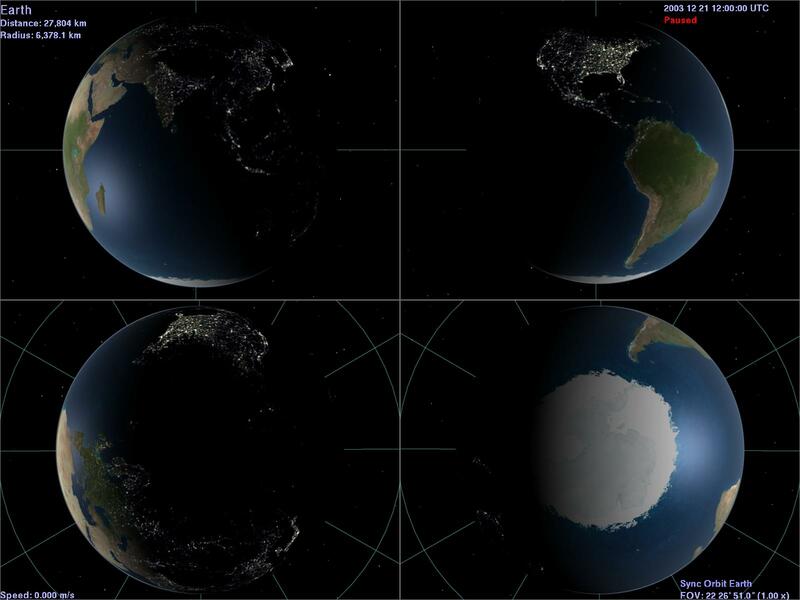 Presumably Celestia 1.2.5 final will draw them in somewhat different locations. 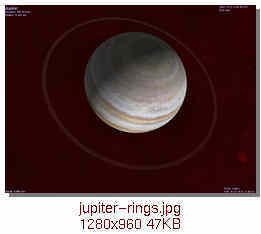 This shows Jupiter's very faint rings. 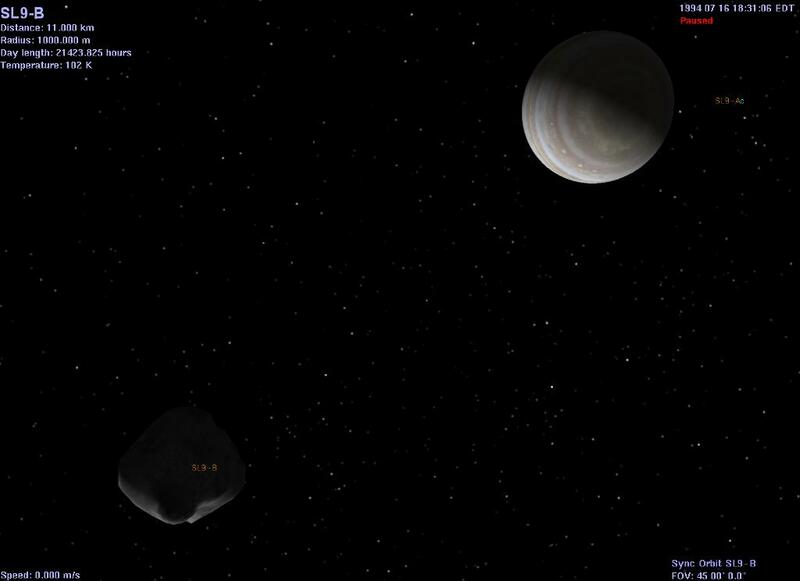 They are just barely visible, even though they're being backlit by an all-sky H-α map. 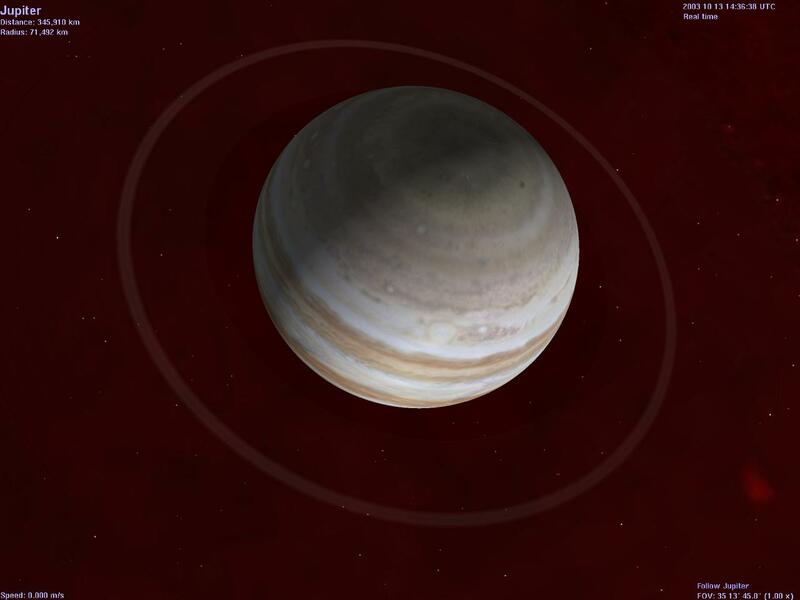 Here's a Cel:// URL to take you to this viewpoint: Jupiter's rings . 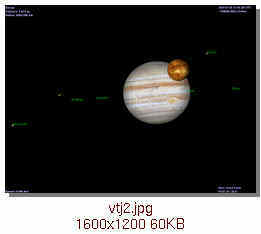 Celestia v1.3.0 or later and a modern graphics card which supports OpenGL v1.4's "ARB_Vertex" routines. 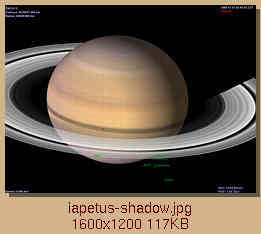 Note the shadow cast by Iapetus onto Saturn within the shadow of Saturn's rings. 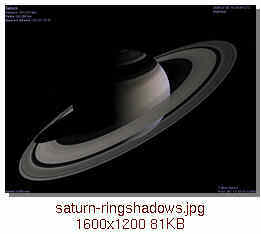 Its shadow should be cast on the rings, too, but that has not yet been implemented as of Celestia v1.2.5pre7. 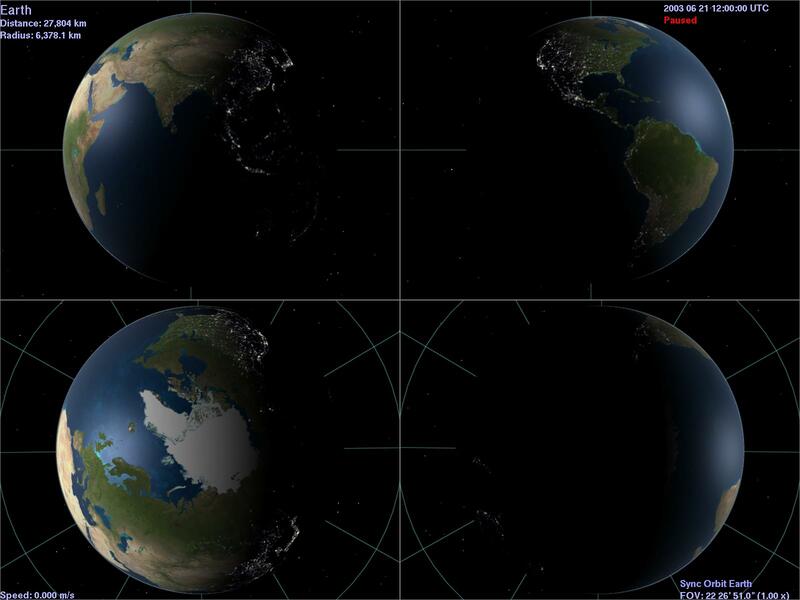 First observed by Paul "Calculus." 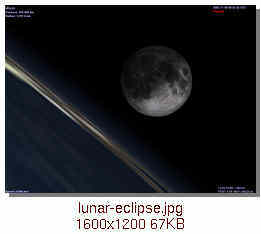 See his screencapture of this event in his Gallery of "Celestia Phenomena". 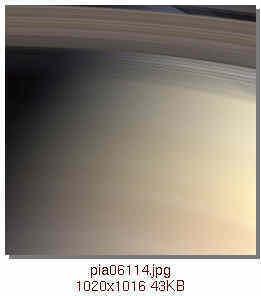 Saturn is the bright dot in the center of the picture. 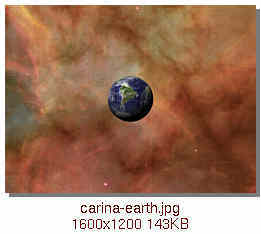 An extra ring in Enke's Gap? 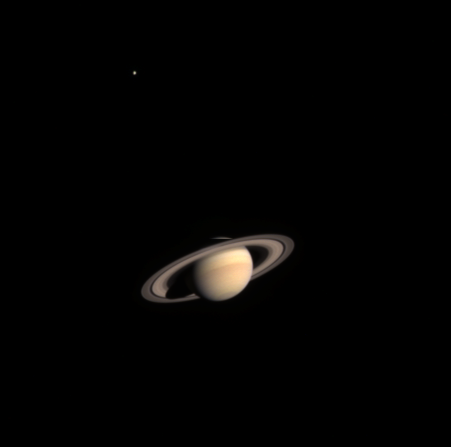 As shipped with Celestia (up through v1.2.5), the file /lores/saturn-rings.png has a misaligned alpha channel, which creates a spurious gap inward from Enke's Gap. 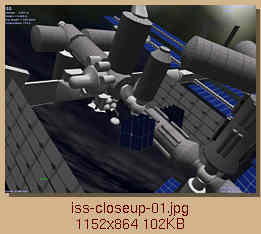 This has been fixed in Celestia v1.3.0. 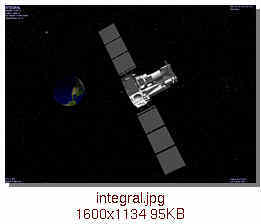 This view requires Celestia v1.3 or the replacement ring image provided here. 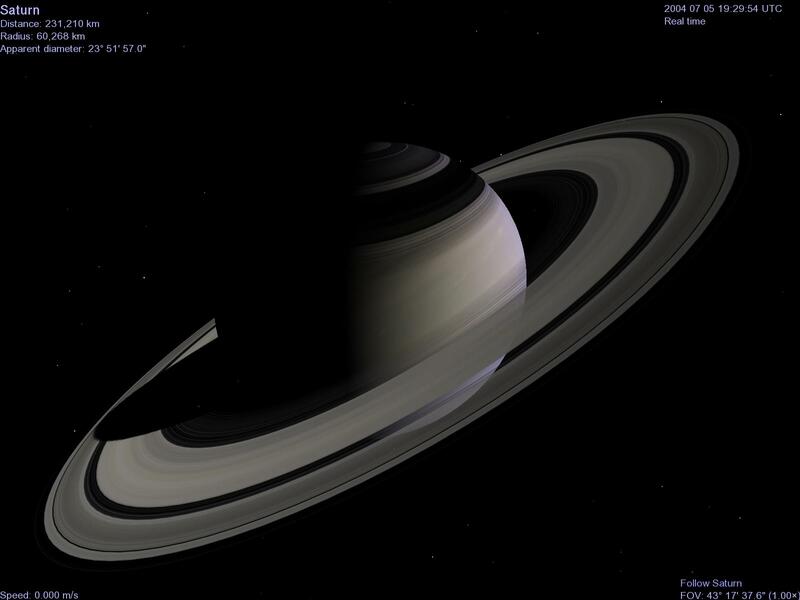 Not needed for Celestia v1.3, this is a replacement for /textures/lores/saturn-rings.png using appropriate reflective and transparency (alpha-channel) images. 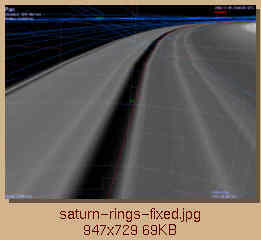 The image maps were obtained from the Web site of Björn Jónsson: http://www.mmedia.is/~bjj/data/saturn/rings.html "A preliminary model of Saturn's rings"
Slight modifications were made to the images so that the major ring features of the transparency channel are aligned with those of the reflective image. 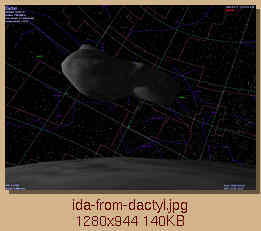 Björn informed me that he used data from the Voyager CDs to create his texture maps, so I'd also like to acknowledge the Voyager Experiment Team Leader, Dr. Bradford A. Smith, the Planetary Data System, and the National Space Science Data Center through World Data center A for Rockets and Satellites for providing the original data. 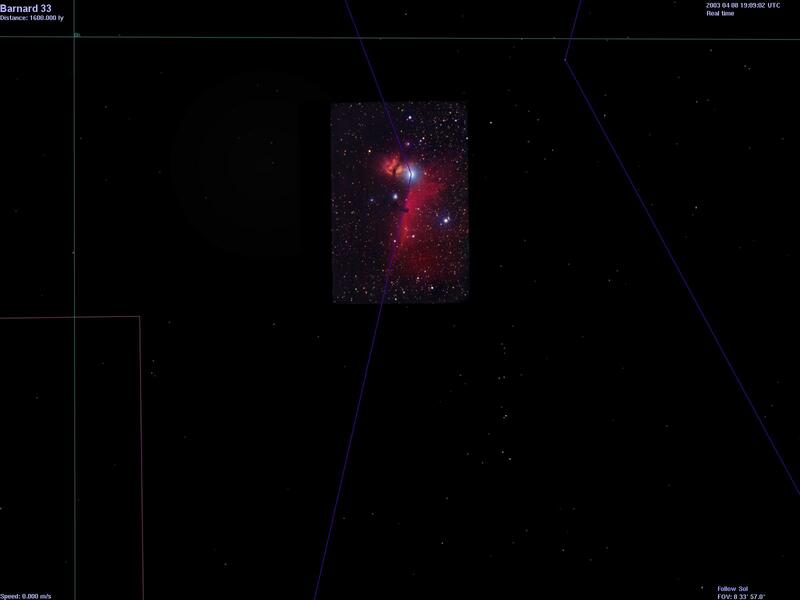 Horsehead Nebula in Orion See also billboard.html. 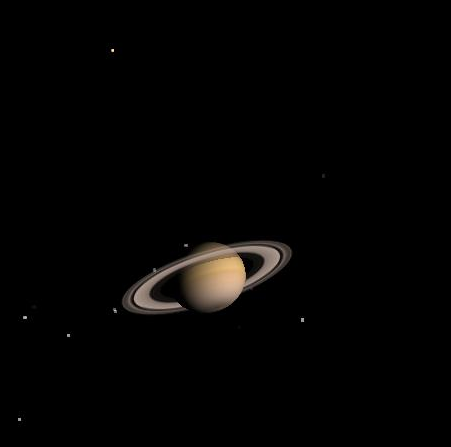 October 21, 2002, 285 million km from Saturn. 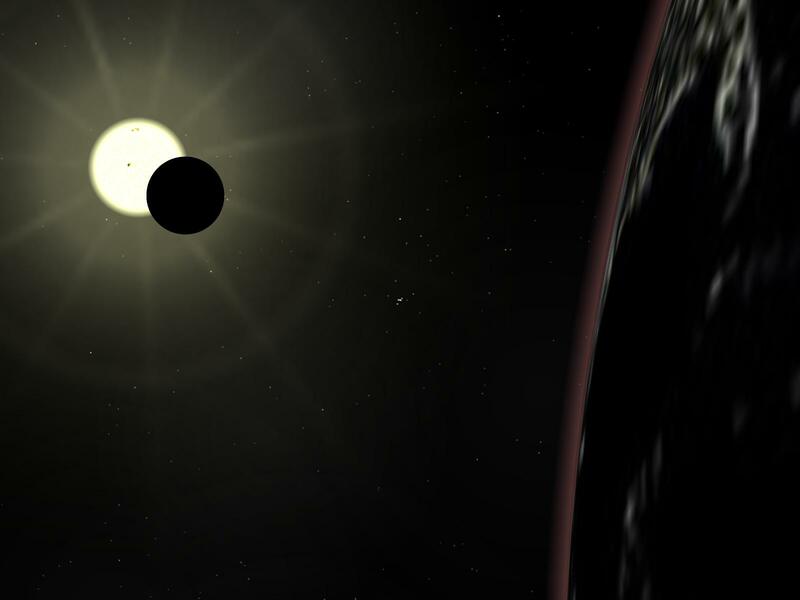 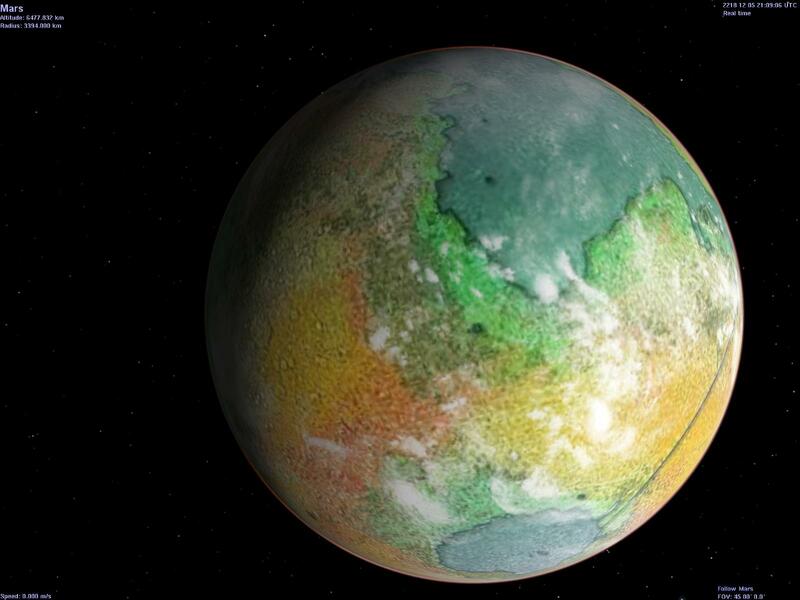 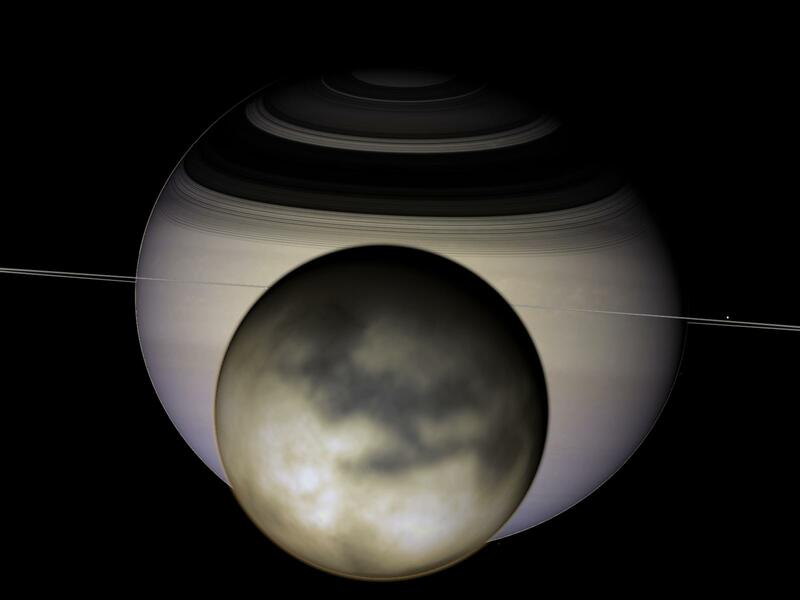 According to the article, the only moon resolved was Titan. 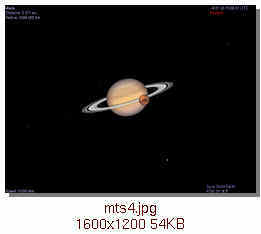 They enhanced its brightness 3x compared to Saturn. 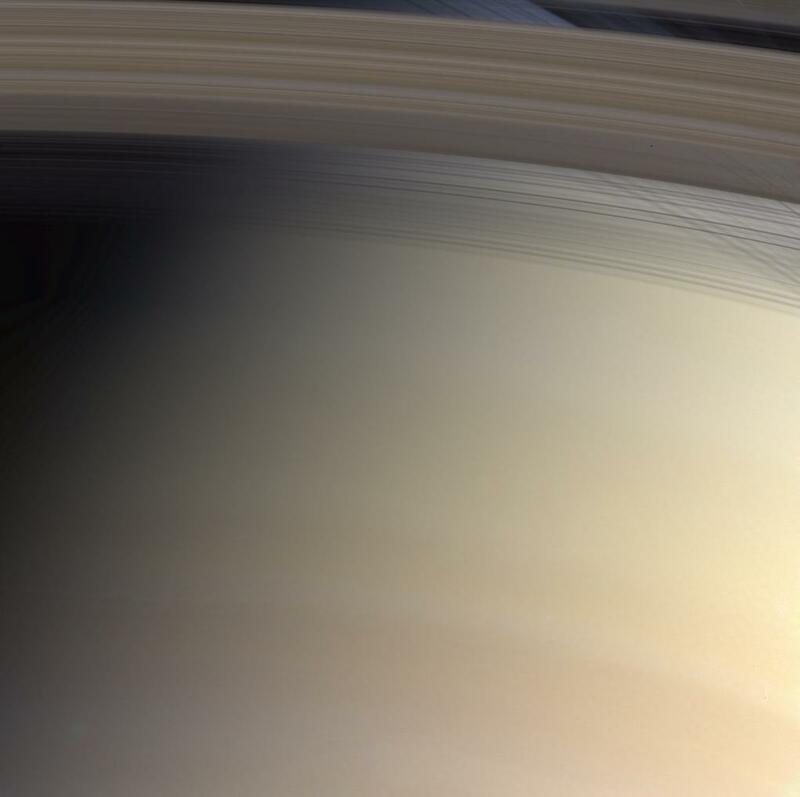 October 21, 2002, 285 million km from Saturn. 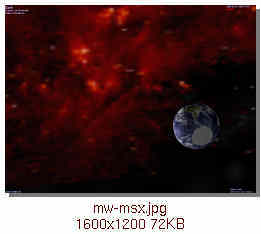 at 2002 10 21 15:54:37 UTC. 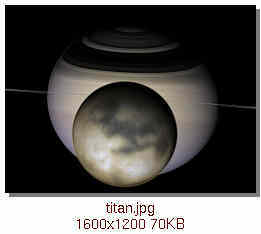 Note that several moons are visible in addition to Titan. 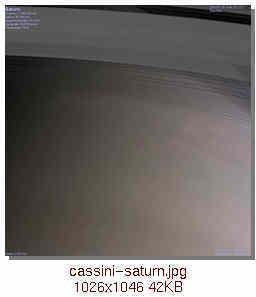 July 30, 2004, 7.6 million km from Saturn. 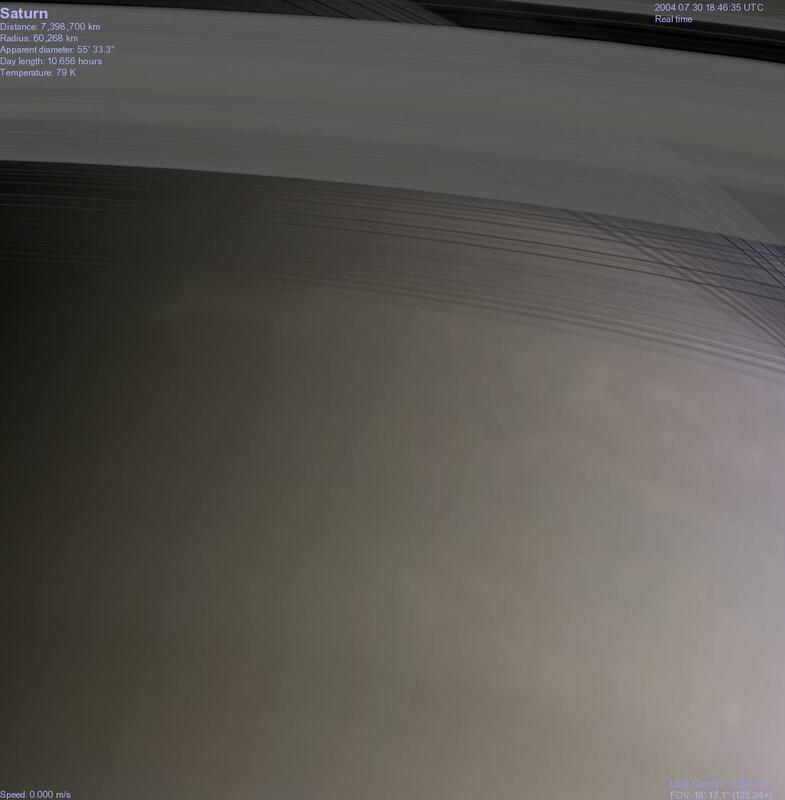 July 30, 2004, 7.4 million km from Saturn. 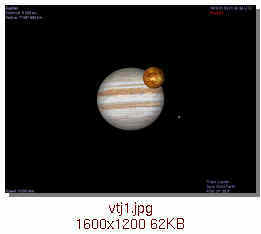 at July 30, 2004, 18:47 UT.